Rent the Curious George Jumper for your next church function, birthday party, corporate event or special event. 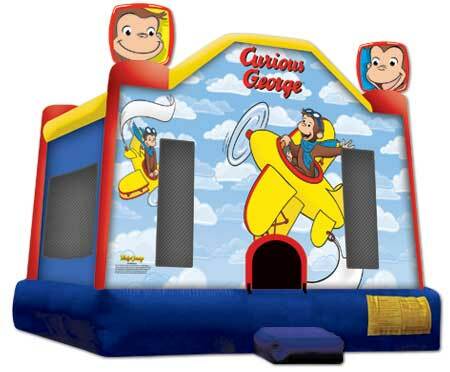 This inflatable game is available for rent in Orange County, Los Angeles County and Southern California. This standard size jumper has a 160 square foot bouncing area. Please add $20 for Monday through Friday rentals. Electrical plug-in must be within 100' of the game to ensure proper operation. A generator is available for an extra $89 for this game if needed. Late night pickup or overnight fees apply for all events ending after 8:00PM. Additional delivery charges may apply. ADULT SUPERVISION IS REQUIRED AT ALL TIMES!